Steeped in nature and punctuated by moments of sublimity in the everyday, 1212 Bordeaux is a building that works for people. 1212 Bordeaux exemplifies how a highly-collaborative project team and an integrated design-build process can deliver an inspiring project that exceeds client expectations. Embodying Google's design principles of beauty and simplicity, 1212 Bordeaux is designed to inspire and empower Googlers, while supporting the long-term health and vitality of the community and environment. The result is Google's first completed ground-up building: an adaptable high-performance "living lab" workplace, delivered on-time and on-budget. The building's exterior walls and cornice are composed of board-formed precast concrete panels. A series of small outdoor garden rooms immerse Googlers in a native habitat while they meet, dine or recharge. Light wells bring daylight to first-floor meeting rooms and draw the eye skyward. Simple in plan, the building comes to life in three-dimensional experience, as diverse spatial volumes create a pleasing interplay between the intimate and the grand. The mezzanine above the second floor provides further experiential diversity as well as cultural connectivity. The open-plan team workspace connects to support spaces and private meeting rooms in the core and lower level through a series of portals and light wells. White oak panels and book ledges in the work spaces provide acoustical and visual privacy, while a soundmasking system mitigates conversational distraction. Northern sunlight—diffused and cooler toned than its southern counterpart—provides optimal light conditions for productivity and creativity. Program elements form a gradient of “buzz, buffer, and focus” zones, supporting a variety of pleasant sensory experiences suitable to different purposes in the workday. Lines of sight were calibrated to optimize sky views from the work spaces. Integrated design provides multiple benefits and increased value. 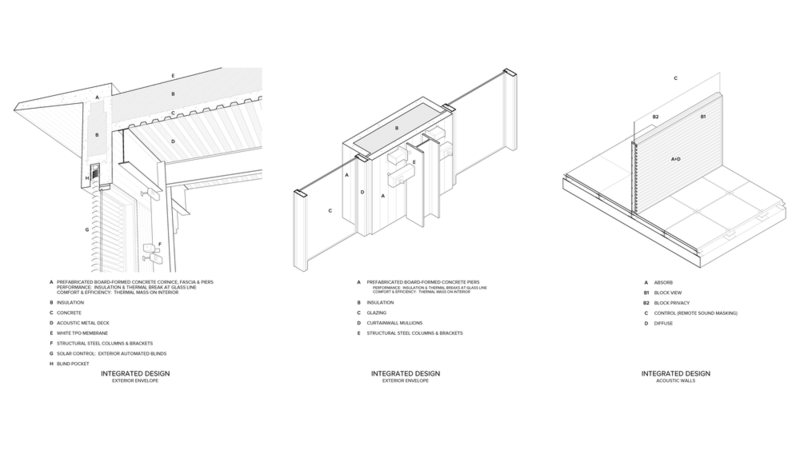 Structural elements and ductwork were coordinated to enhance privacy on the mezzanine while maintaining sight lines to the outdoors. The perimeter of the building features double-height open plan workspace. Enclosed workspaces for smaller teams are below the mezzanine. The building’s infrastructure is a significant design feature, setting the tone for the interiors. 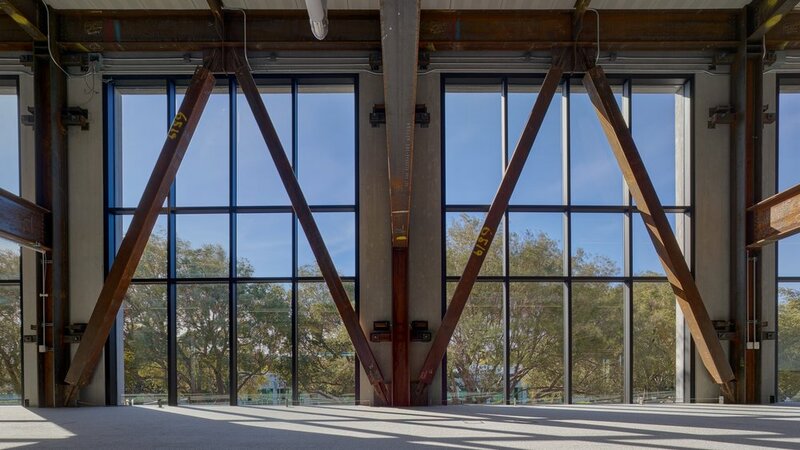 The exposed raw steel structure retains the markings from fabrication, without layers of potentially toxic fireproofing. A second-story lounge in the south-facing "buzz" zone offers an alternative working environment. The poplar bark cladding a lobby wall is the first Cradle to Cradle Platinum-certified material. The building achieved LEED Platinum certification upon construction completion. The plaque is rendered in recycled Palladium leaf onto an exposed structural steel column for posterity. 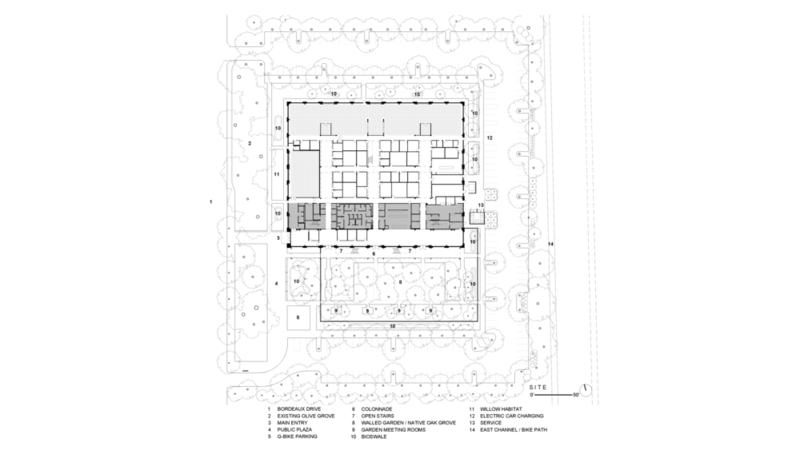 The board-formed garden wall surrounds a grove of native oaks and plantings. The weathering steel terrace and trellis on the south elevation provide seasonally-tuned shading. 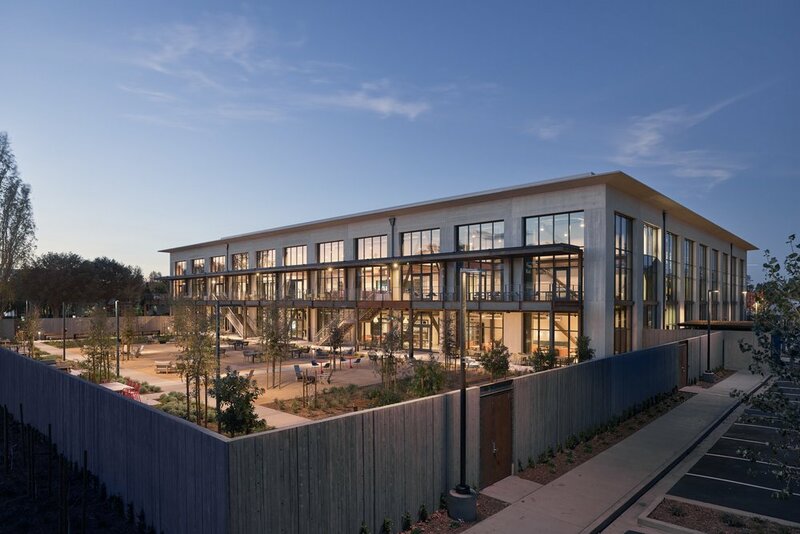 LEED: Point Energy Innovations / Kath Williams + Assoc.